Are you being mislead with Free Blog Hosting? Can you imagine, starting a blog, putting your heart into it, giving it hours of your attention, only to find you’ve taken the WRONG PATH? Would you rather spend a little time learning about your options before committing yourself to Free WordPress Blogging? Now, I totally understand your need to ‘learn’ WordPress before you commit to it, but I know you haven’t gotten this far without being somewhat serious because your time is so valuable. And I know you don’t want to waste it? I’ve helped hundreds of clients transfer their FREE WordPress Blog onto self-hosted solutions and my rates aren’t cheap, but when you get stuck you’ll realise why they’re prepared to pay for a solution. Did you notice what happened there? 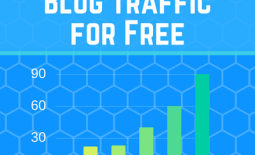 People eventually spend money on their FREE Blog. YES! You heard right, this is no longer free. Ouch! One of the most common mistakes made by bloggers who used Free Blog Hosting is they become too SUCCESSFUL! Yes, that becomes a real problem. Let me tell you why. When you start your free WordPress account, you just need to choose a blog name and you’re up and running. Yay! Surely, that’s quicker than a setting up a self-hosted blogging solution. Yep, you’re right, it just saved you 10 minutes more than someone who chose the self-hosting option, but that 10 minutes is going to cost you hours down the track. Allow me to show you how you can be self-hosted in less than 10 minutes. Oh, I apologise, I neglected to tell you what self-hosting is. A common self-hosting belief is you host the website or blog on your computer at home, but in truth it’s just a company that hosts your website server for you. Now you need not worry about being an expert because the company I used in that previous example has your back with their 24/7 support. So what you see is just another WordPress Blog, just like the Free Blog you get from WordPress.com. But there are some important differences you may have missed, let me show you. #1 When you choose the name for your blog, you got to choose any name that hasn’t already been used, didn’t you? 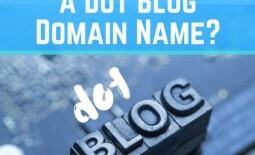 WordPress.com doesn’t insist you use an available domain name, so when you later decide to move onto the Internet, that great name you found might already be taken, or worse still be trademarked to another person, which means you can’t continue to use it. Ouch! Contrast that to the people with a self-hosted blog that searched for an available Domain Name on the Internet that wasn’t already used, you see they’ve already saved a heap of time, didn’t they? 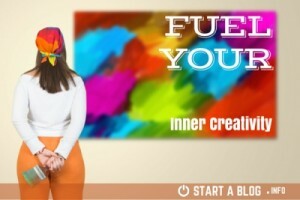 #2 Another misconception is you just signed up for a fully featured blog. WordPress.com likes to ensure the millions of blogs they host don’t break their servers, so they only allow you to do certain things. One of the most limiting features is your inability to load the thousands of different Free WordPress Themes that are available to self-hosted blog owners. That’s right your creative ability is already being stifled. But when you think it through fully, you’ll realise when millions of blogs are limited to theme choices they all start to look the same, don’t they? Where’s you uniqueness then? #3 Now let’s have that uncomfortable talk about money, and more precisely about how you are going to make some. Whoa back there, you did sign up for a Free Blog site didn’t you. Oh, there is something I need to tell you. Well, not exactly how you’d like to anyway. You see WordPress.com owns your blog and may place ads on your blog without your consent. If you are lucky they might even share some profits with you, but this isn’t a given. I just didn’t want you to get your hopes up. Contrast that to the people who are self-hosting their blogs, and can choose to earn extra money from day one. Here is a free guide on how self-hosted bloggers currently make money. #4 While we’re on the subject of money, did you know that you WordPress.com has a premium product? 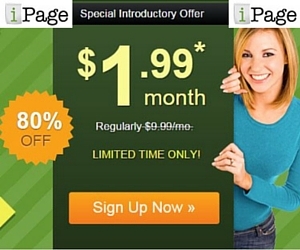 Yes, that’s right you can transfer your Free blog to a Premium Blog and only have to pay $99 per year. What? 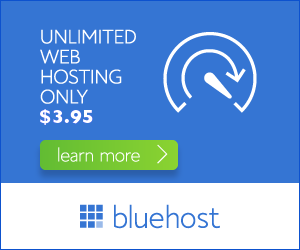 Yes, $99 is twice as much as the cheapest hosting plan from Bluehost I showed you earlier, which with a discounted rate, works out at less than $50 per year, here is that link again, read it this time, because it’s going to save you money. Yes, you’ll get a fully featured, version of WordPress for 50% less, and it’ll cost you 10 minutes of your time. Bargain! Self-hosting is a ‘No Brainer‘ and yet the only reason why people don’t choose this path is they, don’t take the time like you have to learn about all the options. 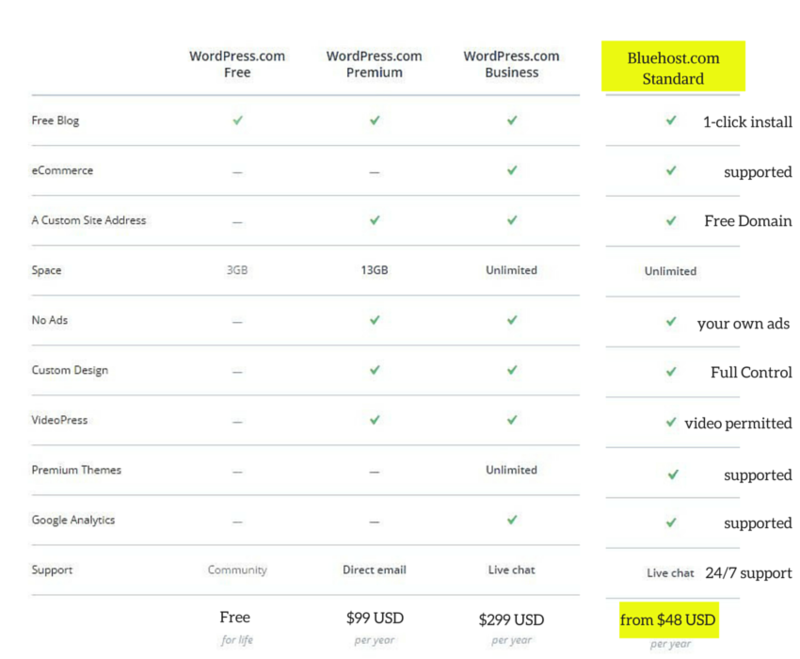 So would you rather continue down the path of FREE Blog Hosting to save you some dollars now, or save yourself a lot more money and time when you become successful? Yes, you’ll eventually need to move your website to a REAL Internet Domain if you want to be seen as professional. Did I mention I wasn’t cheap? But save this link and come and see me at diyblogguy.com when you need me to pull you out of a hole, as I’d be happy to help, for a price. But I’m sure that’s not you. You don’t need to be like the thousands of other bloggers out there that have given up their dream because they went too far down the wrong path. Those SUCCESSFUL Bloggers I mentioned earlier, you know the ones that eventually moved to a self-hosted blog sometime later, had one big problem when they moved from the trapping of a free blog. They usually couldn’t take their Website Name with them, and had to start their branding again, and lost Google Search Engine rankings in the process. But, how does this happen? You see, when your blog is called HappyGardener.wordpress.com and you become really SUCCESSFUL, and finally realise you need to become self-hosted, you naturally search for HappyGardener.com but it’s not available. Why? Because someone saw the potential of that Domain Name long before you did, purchased it and is probably already making money from the website. And because they were smart, they registered a trademark which prevents you from trading in that space. Bummer, Hey! Fortunately, for you SadGardener.com is still available and you’ll just need to change your attitude. That there is the Number 1 reason, bloggers who spend hundreds of hours developing an audience on their Free Blog, eventually just give up, because it gets too hard. This is also the reason I decided to write this guide, not to sell you anything but to give you options, and hopefully you’re smart enough to choose the right path. Sure I’ll help you when you get stuck, but I’d prefer to help you make the right choices from the start, so when you eventually do need my help, it’s just so we can work on the steps you need to follow to make blogging into a full-time career. 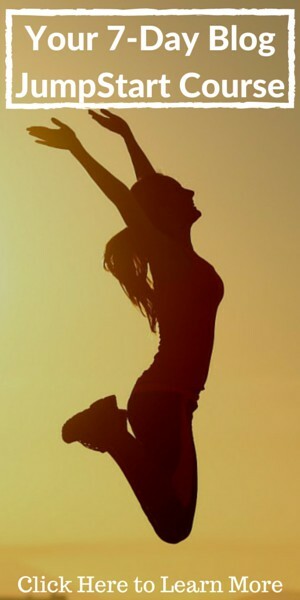 It’s time for you to take decisive ACTION! Here are those resource links I’ve mentioned throughout this guide, and come and say hi to me on Twitter @diyblogguy when you get a chance. Oh, and one last thing. 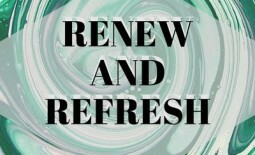 At the very least try to secure the domain name for your new blog, so when you eventually make the transition to self-hosted blogging at least you won’t be disappointed when you have to change your blog name. 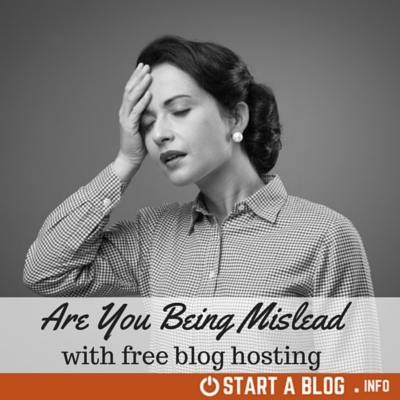 Share the post "Are you being mislead with Free Blog Hosting?"